It’s a rare occasion when following defeat the Yellow Army departs Carrow Road with spring in the step and pride in the heart, but yesterday was one of those. Entirely in keeping with the well-deserved standing ovation and hearty rendition of On the Ball City at the final whistle, the mood was positive and, bar a few numpties who still saw fit to pick holes and find fault, pride appeared the overriding emotion. While City didn’t quite have enough in the tank to come back from a goal down to make it eight unbeaten, there was still so much to admire about the performance, one that was still full of verve and belief in spite of the aching limbs and tired minds. The international break has for once come at the right time – in fact, we could have done with it one game earlier – but what it must now do is serve as a launch pad for another sustained run of good performances and, hopefully, results. What we don’t need is yesterday’s unfortunate defeat putting a dent in the collective confidence, which of late has been positively oozing. Stoke got away with one, and they know it, but to be fair it was a composed defensive display that, as the game wore on, saw City slowly run out of ideas. From a footballing perspective, it was a no-contest but in this age of stats and data, there still remains only one stat that matters. The amount of possession, touches in the opponent’s box, expected goals (xG) etc are all very interesting and, of course, play their part in coaching teams being able to analyse performances, but they make no allowance for Timm Klose unintentionally toe-poking a harmless-looking cross past a helpless Tim Krul. It was just one of those moments. They happen. Those of us who have played have all been there. And we have to be honest… in this good run, we’ve had the odd break or two. For one to go against us is gutting at the time but just part of football. One to be taken on the chin. Instead, we should look at where we were when we went into the last international break and ask ourselves if progress is being made. The answer is obviously an emphatic yes. Better still, there is yet more to come. For all the really nice football, which has benefitted immensely over the last month from a subtle shift in gear, there is still insufficient end product and yesterday we’d have all liked to have seen a busier Jack Butland. But this is all stuff that is being worked on on the fields of Colney and given the improvements that have been so evident in the last few weeks – performance levels are now a far cry from those on show in that turgid local derby – we have to trust Team Farke to solve this riddle too. 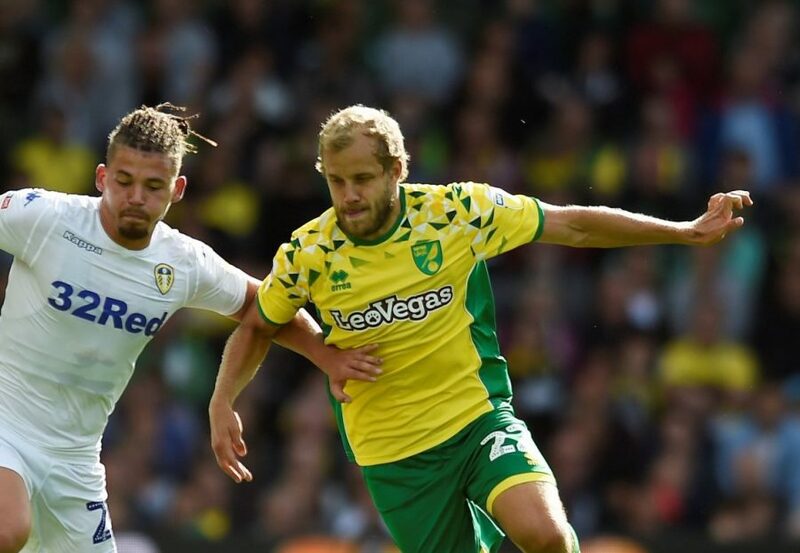 It certainly didn’t help the cause that Teemu Pukki’s incredible run has drained him of energy and that extra half-a-yard that’s so vital for strikers but, equally, there was an undoubted logic in Daniel Farke keeping faith with an unchanged line-up and asking them to go again one more time. Maybe the coach could have swapped the tired limbs for fresh ones a little sooner yesterday but such was the performance level, especially in the first half, there was clearly belief in the technical area that they still had enough in the tank to get the job done. On another day they would have done. Yet we should still take great heart from the fact we have a bench that is now really able to impact on a game. Onel Hernandez and Mario Vrancic were both able to add something that wasn’t there yesterday, albeit the breakthrough still never came, and gone are the days when late changes are made merely to add ‘fresh legs’. This City squad is very much that – a squad – and to think that Grant Hanley, Kenny McLean have played no part whatsoever in this run. Now the dust has settled on season 2018-19, this group looks to have a greater depth, even minus the Maddisons and the Murphys, and a nice balance to it. And the methodology that has been drummed in since May 2017 is starting to bear fruit. Whether part of the grand plan was that Max Aarons and Todd Cantwell would play such key roles in this set-up is one for Farke and Stuart Webber to answer, but both were excellent again yesterday – as was Jamal Lewis in his dual with Tom Ince – and it’s telling that none of the young players play like young players. Each has been integrated into the group as equals and are growing in stature before our very eyes; all contributing every bit as much as the senior pros in the squad. Of all the good things that have emerged in the last month, it’s the joint-emergence of Aarons and Cantwell that gives off the warmest glow. That shouldn’t, however, detract from the new heroes that have come from nowhere. Marco Stiepermann has been reborn, we’re seeing the Mo Leitner of the Borussia Dortmund vintage, Alex Tettey is playing the best football of his career, Tim Krul is now the Tim Krul we wanted and the German/Swiss centre-back combo has been simply superb. All we ask is that this isn’t peak Norwich City, but instead is the foundation of a good season of entertaining football. I’m still not convinced the top six is our natural resting place, but performance levels like those we’ve seen over the last month could take us close. And, most important of all, it’s fun again. It’s starting feel like the beginning of something special, although City need to figure a way to crack opponents who set up to defend in numbers and frustrate, rather than turn up with the intention to play attacking football. Great article Gary and SO many positives to take from yesterday’s game (and some of the more recent ones). Farke and his assistants are building a team that isn’t afraid of anyone and we just didn’t get the ‘rub of the green’ yesterday, but had we scored first …..
IMO, Cantwell can easily replace Maddison and I well remember a fellow fan at an Under 23 game early last season saying that he could, whilst another fan who was sitting near me and said, “No way”, is now putting on weight from eating so much ‘humble pie’. What I found really pleasing from yesterday is that fans no longer berate the younger players when they make a mistake, as so much of what they do is excellent. I really hope that DF and his team are here for a few more seasons and what has happened to some of the negativity that used to pervade the articles on MFW??? PS – I thought it was fantastic to hear the applause n 53 minutes and it shows the togetherness of the fans. Gary, it’s simple. Norwich appear to be playing football. Not some bizzaro world version of the game where endlessly passing it between defenders was the goal. Who knew that a settled side with some attacking intent (what everyone was asking for) would stop people moaning? We still play it patiently between defenders, waiting for the right opportunity to move it forward – but we now have players with the mobility and intelligence to be purposeful when that happens. All exactly as Daniel Farke said he was working towards. You will have a better sense than I Gary since you were at the game, but I still get the niggling sense that even though the time performed well we paid the price for DF failing to freshen up a side with patently tired legs. He’s paid to make the tough decisions and the tough decisions yesterday were to say to a few players, look, you’ve done brilliantly for me and the team over the last few weeks, but I really think you’d benefit from a rest today, and maybe coming on as an impact sub later in the game. Players I would have put into that category are Pukki and Buendia, who were both obviously tired already at Derby, and I would have started with Rhodes and Vrancic. For neither of the latter two to have had a league start since the last break doesn’t make sense however well others have been playing. I might have been tempted to rest Aarons and Cantwell too, but certainly would have brought Hernandez and Rhodes on earlier, and would have subbed Pukki then not Steipermann. Maybe all quibbles, but I don’t see the point in having greater depth in your squad, as we do this year, if you don’t employ it intelligently, and yesterday was crying out for some changes (well Wednesday was too), simply on account of fatigue, and also to give the opposition something else to think about other than the lineup they had no doubt predicted in advance and planned against. We’ve been playing well, but the secret to continue to pick up points regularly is to keep playing well whilst being able to rotate 2-3 players in and out relatively regularly. Paul Lambert was a pastmaster at doing that and one of the reasons we did so well the Championship promotion year with him, and even the first year in the Premier League. It’s not being disloyal to players who have performed well to give them a break when their energy levels are draining, rather its smart player management. Farke I think did not score well on those grounds this week, and we picked up just 1/6 points as a result. Yes, the team still performed, but the spark was fading, and that’s up to the manager. He has to be able to do some player rotation without breaking up the rhythm and performance levels of the squad. I hope he will improve at doing this post the break. I worry that injuries will demand changes and those called upon will have had too little game time to fit in. Godfrey for example is just being used to make up the homegrown quota. It is a difficult conundrum though. I think team selection was a tough decision for this game. I was anticipating a change (I thought Vrancic would come in) but equally I understand why he stuck with it. Farke could have made those changes suggested, the performance level could have slipped & we’d be reading today fans complaining about changing a winning team. It’s all small margins. I take the points about player rotation but can also appreciate that DF wanted to keep the team spirit. It was an annoying one yesterday. That extra day recovery for teams really makes a difference. Stoke always seem to do that to us at Carrow Road. When did we last beat them at the Carra? In my memory they always seem to get a lucky point or a scappy 0-1. win. As for luck, you cannot legislate against two flukey goals costing us points in successive games. The key is that ‘ we go again’ as someone once said and start another run. My only criticisms would be that a) we should have introduced the subs a bit earlier, and b) there was a lack of composure when delivering the final ball into the box. Vrancic had very little time to play himself into the game, and high crosses into the box were never going to succeed given Stoke’s large defenders against our smaller team. However, some of the football we played, particularly in the first half, was excellent, and deserved a goal. I couldn’t tell for sure from the River End if we should have had a penalty for a late foul, but it certainly looked like it. Klose was extremely unlucky with the own goal. We keep going on about Lambert and what he achieved at city that is in the past and he jumped ship once he got a better offer which no one can blame him for, but rumours were abound that he would be Villa next manager even before the last game, he got well paid for the job he done but city seems to have turned out so far as the pinnacle of his managerial career. The doom and gloom merchants were out in the Pinkun again yesterday, yes Farke was a little later in his substitutions but to say he doesn’t know what he is doing and again sack him is just plain silly. We all watch agame and say why didn’t they do this or that but Farke knows his players better than we done, the effort he saw the team trying to retrieve the game must have given him hope they could do it and didn’t want to hit anyones confidence, and yes sometimes it is hard to pull someone when he is giving everything to the team, yes he is paid to make these decisions and how would it have been looked on if he made the changes and Stoke actually did score a goal for themselves. All have said Vrancic, Rhodes and Hernandez made an impact once they came on but who is to say if they came on 10/15 mins earlier they would have made the same impact, when they did Stoke players were just as tied as City’s were. Opinions vary and the good run had to come to an end even with an OG but lets look forward to the next good run after the break. Yes could have made changes earlier as it looked liked some seemed to be feeling the recent run of games.However yesterday’s match was just one of those games where had we still been there today we would not have scored.I know that those of us who have watched an abundance of football over the years will have witnessed these very frustrating affairs. I don’t think that this bunch of players as young and as exciting as they undoubtedly are will have enough to get city over the line this season ,I believe that the inexperienced will feel the effects of such a long and arduous campaign ,I have just in case though employed the services of Paddy Power,fingers crossed. One thing is for sure that I will be enjoying watching this team grow and mature and eventually taking city back to another tilt at the Premier league. I am as happy as anyone with the Farke revolution and I think it is very much ‘on track’ and have been saying as much since the first half hour against West Brom. What we have to do now is convert the system into goals. At the moment we are converting a high percentage of chances made but as the 3 shots on target yesterday suggest we don’t make enough chances. It will come – and when it does we are a top 6 team.